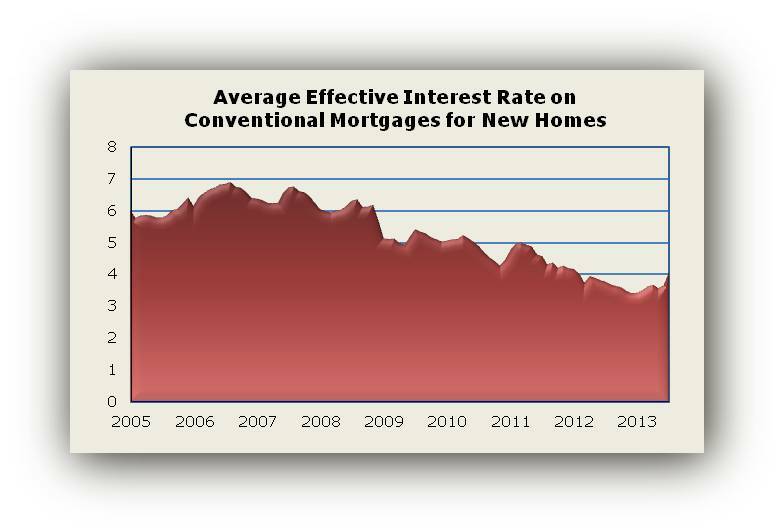 In July, interest rates on conventional mortgages used to purchase newly built homes increased for the second month in a row, according to data released yesterday by the Federal Housing Finance Agency (FHFA). The new FHFA data show the average contract interest rate on conventional loans for newly built homes increasing by nearly 4 tenths of a percent, to 3.94 percent. Initial fees were little changed, so the effective rate on the loans (after amortizing the fees) was also up roughly 4 tenths of a percent, to 4.07 percent. Meanwhile, the average term on conventional new home loans continues to hover around 28 and half years (28.4 years in July). After the July increases, both the contract rate and effective rate on new home loans were higher than they’ve been at any time since January of last year. The FHFA release also includes data on loan size and house prices. After two months of declines, the average size of new home loans and price of the homes purchased with the loans both increased in July. The loan amount increased from $295,800 to $303,300, while the purchase price increased from $387,700 to $394,400. 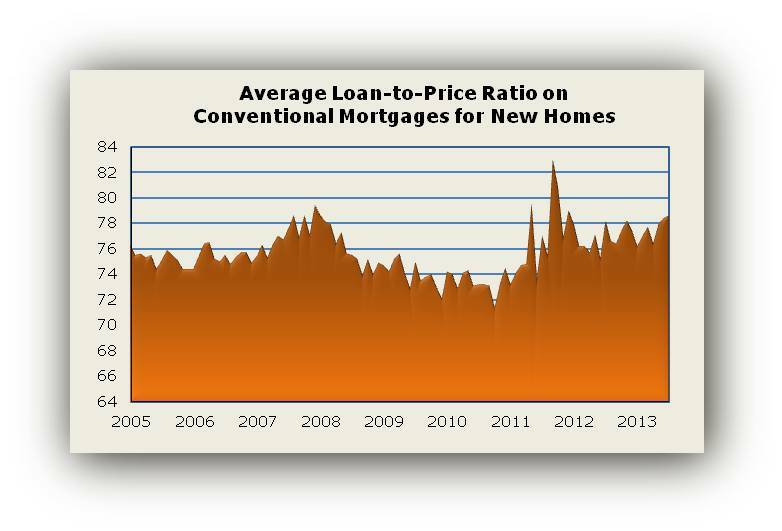 Because the loan size increased by a few hundred dollars more than the purchase price, the average loan-to-price ratio on conventional mortgages for new homes edged up—from 78.4 to 78.6 percent, the highest it’s been since 2011. This information is based on FHFA’s Monthly Interest Rate Survey (MIRS) of loans closed during the last five working days in July. Loan terms are typically established 30 to 45 days before closing. For other caveats and limitations of the survey, see the technical note at the end of FHFA’s August 29 news release. This entry was posted on Friday, August 30th, 2013 at 12:42 pm and is filed under By the Numbers, Data. You can follow any responses to this entry through the RSS 2.0 feed. You can leave a response, or trackback from your own site.